Defend yourselves from having one A&E between 750,000 residents. As you hopefully know, various services at Lewisham Hospital are under threat due to the recommendations of Matthew Kershaw, the TSA appointed to review the South London Health Trust. 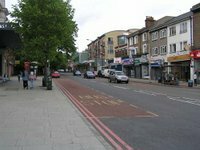 The South London Health Trust was created in 2009 to try and solve the problems of the Princess Royal in Orpington, Queen Mary's in Sidcup and the Queen Elizabeth in Woolwich which were losing money. 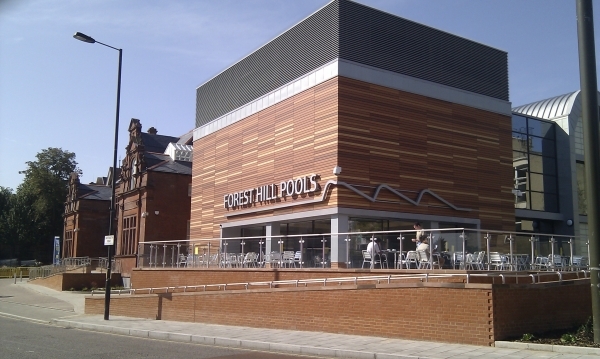 The trust has since accrued debts of more than £150M. The TSA has made a series of recommendations to the Secretary of State for Health on how he would deliver access to safe, high quality, affordable health services and a long-term sustainable health economy for the people of south east London. These incluse closing parts of Lewisham Hospital, selling off land and expecting us to go to King's College Hospital in Camberwell or Queen Elizabeth in Woolwich. We, and many physicians, disagree with his conclusions. 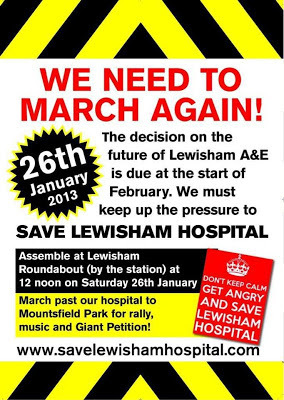 Save Lewisham Hospital is a community campaign fighting against the proposed closure of Lewisham Hospital including its new A&E department, Intensive Care, maternity and children's services. We will be joining them in a demonstration on Saturday 26th January to show Jeremy Hunt that the people of Lewisham are determined to SAVE LEWISHAM HOSPITAL! Jeremy Hunt, the Health Secretary, will make his decision at the start of February. If you would like to join us, please either meet us at The Capitol (JW Wetherspoon's) on London Road at 10:45am or at Catford Bridge station, where we will be catching the 11:38am Southeastern train service towards Lewisham and London Cannon Street Rail Station. The march will start at Lewisham Roundabout (by the station) at 12 noon on Saturday 26th January and march past the hospital to Mountsfield Park for a rally, music and giant petition (about two miles). If you are planning to travel to the march independently, there are four buses from Forest Hill to Lewisham; routes 122, 185, 75 and P4. However, based on experience from the previous demonstaration, we would recommend either walking from Catford or catching a train to Lewisham as traffic in Lewisham was severly delayed. Over 10,000 people marched through Lewisham on 24th November 2012 – young, elderly, families and people from every background, so we have allowed for delays in getting to the march. We need a huge turnout, so encourage everyone you know to come and march with us on Saturday 26th January. We will be easy to spot - we will have placards and hi-vis jackets on.